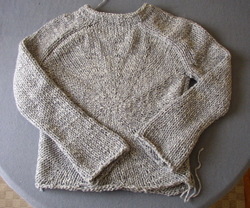 Seriously, I think I've actually done enough knitting for two of these, so many times have I frogged the thing. First time, down about five inches. Frogged for tension. Second time, seven inches or so. Frogged for being too damn big. Third time, all good to the heel. 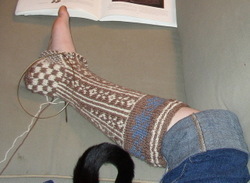 But then, this is the fourth iteration of the heel, I think. I tried two different versions of the the flappy heel thing that's more "traditional," or whatever, and ended up disliking the feel of it on my foot. So, again, frogging back, and doing another afterthought heel (which was started once, then restarted whenn I realized I'd messed up the checkerboard pattern). I actively like how they feel on my feet. So, there. Of course, this may be the more interesting thing. The inside looks so cool! Like, I almost want to wear them inside out, so cool does it look! I won't, because, a) I wove the ends in on this side, so that'd be icky; and, b) because the little loopy bits where yarn's carried over would catch onto things, and that'd annoy me. But, cool! The Norwegian stocking, made to fit. I cast on 68 stitches, added two after the ribbing at the top, had 70 for the blue pattern, which worked out perfectly for the repeats. Then I decided to keep a straight line down the back, and decrease the pattern into it, as you can kind of see. I decreased once on each side after each little motif was done until it got just about right. It could be a little tighter at the ankle, but that make sit hard to put on. 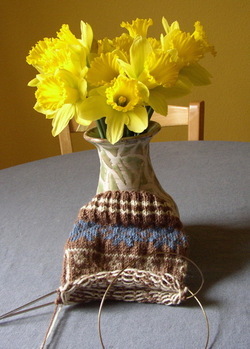 Now, the heel's not perfect. I'm going to have to tighten some of the stitches while sewing in the many, many ends when I'm done. And, in other news, I'm heading to New York tomorrow for a conference and to see a friend. So, no posts for a while. But I'm sure I'll have to show off the results of my airplane and airport knitting once I'm back! So, first, I'm proclaiming my celebration of St. Patrick's Day to be that I planted seeds that will eventually turn into green things. Late this afternoon I made a run to the garden store, and when I got back I cleared off the leaves I'd used as mulch, pitchforked the soil to loosen it up (it's lovely and damp right now), pulled out the icky evil bindweed roots I came across, and planted two rows each of: arugula, bok choy, chard, lettuce, peas, and spinach. Yes, I did them in alphabetical order. I'm a geek. In other news, the Norwegian stocking are cute... but so very much too big. I did indeed frog the first iteration, and this is what I've gotten done on the second version. I'm in general much happier with it. My tension is much more even, so the patterns are appearing more clearly (in the first version, the cream bits tended to disappear into the taupe because I pulled those stitches too tightly). I managed to get rid of the little blip that had formed at the beginning/end of each round (again, tension). But it's too big. You can see it at the bottom of the picture on the left. (Er, I mean the bottom of the stocking, which is... well, you get it.) But it's a problem all the way up, as you can see in the picture on the right. I've decided that I think I can get away with removing an entire iteration of the blue pattern; that's fourteen stitches gone, but that doesn't seem like it'll be too tight. Probably. 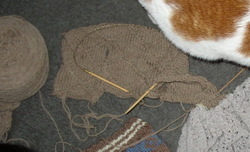 That'll then require more thought about the cream pattern, and a different approach to shaping the calf. (Hmmm... I'm suddenly thinking that the shape of these stockings as written is rather like the pre-felted Russian valenki... I wonder how they'd felt....) So, I think that the next step is more frogging. 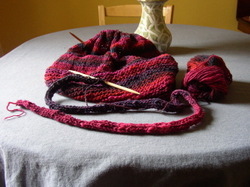 And then knitting, again. I actually did something sort of silly while working on these. I watched a long movie with subtitles. And somehow, I managed it much better than expected. And the movie was really something very good. Called The Best of Youth, it's an Italian film about a family. OK, it's a six hour long Italian film about a family, originally broadcast on Italian TV and then released theatrically around Europe and in the US (in two parts, of course). Seriously, it was a very well spent six hours. When I say a family, I'm not even talking about a huge multigenerational type thing. It's mainly about two brothers, and then also their parents, their loves, their friends, their sisters, their kids, between the mid 1960s and the early 2000s. There are politics, because there were fairly significant changes in Italy's political system during this time period. There are family issues. There are personal issues. There's quite a bit about the treatment of the mentally ill, which sounds like a strange thing to have jump in there, but somehow isn't. I can't really explain why I liked this so much. Or, rather, why it moved me so much. For the most part it's not melodramatic (with a few exceptions, but they kind of work). The action is really pretty limited. There aren't lots of panoramic shots of BEAUTIFUL ITALY, although there are some. It's just, well, very good. Oh, the sap bit? Yes, it had me crying. But it had me crying in the same way that the last Frederica book by A. S. Byatt (A Whistling Woman) did. It wasn't entirely that due to sad things happening (though there's a bit of that). It was more the sense of having gone through a journey with these characters and having it come to an end. I know I do not need more yarn. I have yarn enough for multiple future projects. The thing is, though, that most of those hypothetical future projects require extensive planning. 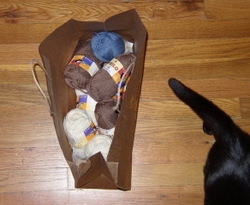 I've bought yarn because I've liked it, not because I've had a specific plan for it. Or I have a vague plan, but have to sit down and swatch and calculate and basically figure everything out. So, despite the fact that I've got plenty of stuff going on, when I saw these while browsing around a knitting forum, I decided I must make them. I don't really understand why. I don't wear knee socks. They're going to be hot and heavy. And yet, I want them. So, I got the book from which they come (see, there's the thing... a pattern) from the library. 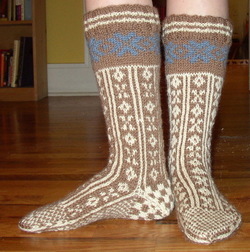 Folk Socks, by Nancy Bush. I think I'll end up buying the book, actually, because it has a ton of information on sock construction. But for the moment, the library copy will do me just fine. And today, I stopped by the LYS and picked up yarn. I'm doing totally different colors, because why not. I wanted to stay in the brown family because I just might, I suppose, wear them under a pair of tall boots, and the tall black boots I've been wearing are too tight. Man, I don't need to start these. I have a conference paper deadline on Thursday, and am not near done with the paper. Ugh. I've turned into my students.